2016 • VDMA MINING SUPPLEMENT VDMA 29 Mines try to reduce dilution or the amount of waste rock entering the production stream in the pit. 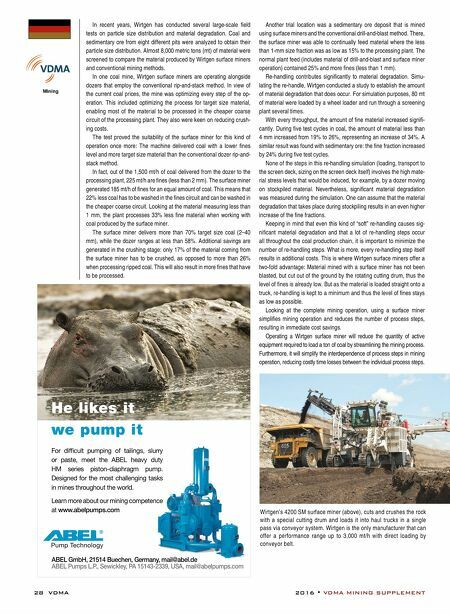 After all, tailings storage is a cost, and in some cases, an environmental liability. The object is to leave as much barren rock in the pit as possible, but working with an excavator and truck has its limitations when it comes to quality control. Once the ore (or coal) reaches the plant feed, it's now the plant's responsibility to safely recover the most minerals, cost effectively. Economies of scale are well understood in the mining business. Ordi- narily, the larger the process stream, the more minerals are recovered. Availability is key. Oftentimes, water and power present a problem. Wa- ter is used for several processes. The plants are powered by electricity, which can be expensive in the remote parts of the world where most mines operate, and the mines usually have either too much water or not enough. Both situations are less than ideal. Iron Ore Grinding in Brazil During October 2015, Loesche celebrated the commissioning of a pi- lot plant for concentrating dry iron ore, developed by New Steel. The new facility is located in the historic mining city of Ouro Preto in the Brazilian state of Minas Gerais. New Steel has developed a revolution- ary new process for iron ore concentration for which the company was recognized with the Platts Global Metals Award for Innovation in 2015. This new process uses Loesche grinding technology and is considered 100% sustainable and unprecedented in the world. The commissioning of the pilot plant drew a lot of interest in the industry. High-ranking members of the mining industry, such as Vale and Hatch, were impressed with the trailblazing advantages of the new concept, which can produce valuable concentrate from even low grade iron ore wastes without contaminating water and by consuming much less electricity. Loesche provides the technically so- phisticated grinding technology, which has been specifically developed to suit these requirements. At its core, the process operates with a newly designed dry mag- netic separator, developed by New Steel. This separator offers unprec- edented separation efficiency even in dry operation mode. To do so, the separator has to be supplied with a ground product of a certain suitable particle size distribution, which the Loesche mill provides consistently. With thoughts toward sustainability and keeping costs low for cus- tomers, Loesche recovers mills from operations that have closed and tries to find new homes for them. During the last 6 years, the company has refurbished and sold 22 second hand mills. All of which were pro- cessing different raw materials. Mineral Pro C essing: i MP ro V ing r e C o V ery Using technology, processing plants can improve safety and lower costs Erlau AG | 73431 Aalen, Germany SAVE YOUR TYRES USING ERLAU TYRE PROTECTION CHAINS TIME TO CUT YOUR TYRE COSTS! 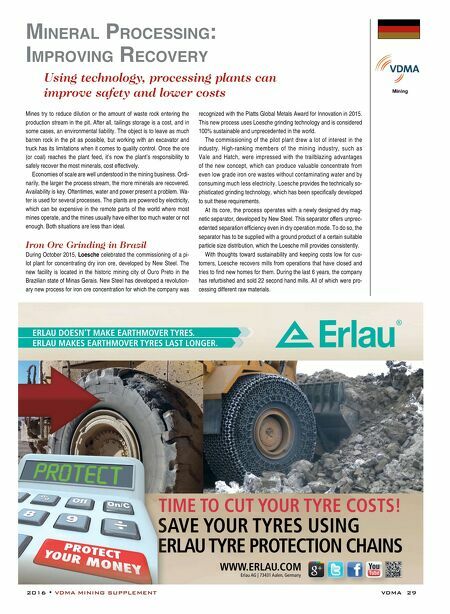 SAVE YOUR TYRES USING ERLAU TYRE PROTECTION CHAINS TIME TO CUT YOUR TYRE COSTS!